On those days when you’re near-broke but can’t stomach another cup of dehydrated noodles, it’s nice to know of a few cheap lunch spots near campus. Here’s your cheat sheet. Ssshhh, don’t let word get out. 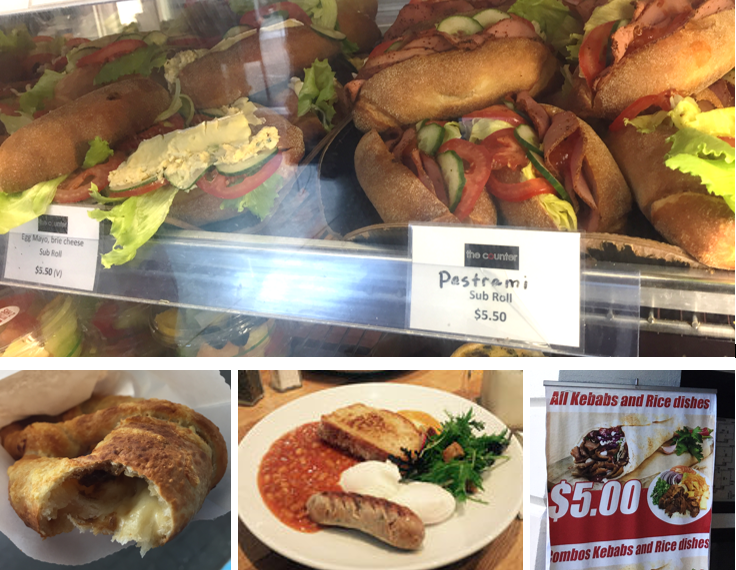 The Counter Cafe in WF building has a great selection of well-priced sandwiches. You can pick up an enormous sub with an assortment of fillings for $5.50, or grab a boxed sandwich from $4.50. They also run good weekly specials – for next week only (12-16 March), you can get a burger for just $5 (while stocks last). At Refuel in WC building, you can pile up your plate at the hot buffet for only $6.50 (or prepay for 10 lunches at only $6 each). Piko2Go has lots of cooked meals to take away for $8. At the corner of Lorne & Wellesley Streets, just opposite the city library, you’ll find a hole-in-the-wall joint called No. 1 Pancake. A fried Korean pancake stuffed with meat and cheese will cost you $4.50. If you’re keen for a Queen St lunch, try a stuffed pretzel from Popa’s Pretzels at 350 Queen St for $5. The cheese & Marmite flavour is a Kiwi classic. Right next door to the pretzel place (and also opposite WH building on Wellesley St) is Star Kebab, where a plate of rice, meat & salad can be yours for $5. The food court in AS building has quite a few good options for a cheap lunch. Kebabs on Campus has burgers with your choice of meat for $5.50. Al Parco has lots of options under a fiver. The all-day breakfast is generously proportioned at $6.50. Check out the KaiFé buffet in MD building – it costs just $6.50 to load your plate with hot food, and you can eat on the terrace with a view of the swimming pool outside. KaiFé also runs weekly specials, and next week (12-16 March) they’re doing $5 burgers (while stocks last). Hop across the road from campus to Food Junction at 613 Great South Rd to find a whole lot more options. Trattoria does $10 pasta mains; Thai Bangkok has five chicken spring rolls for $7.50; and MC Roast has hot sandwiches for $6. For a quick energy boost, try a whey protein shake at Wholefoods for $5.90. Venture a few steps off campus to 1 Antares Place to sample the local favourite Pickles Cafe. The menu items are pricey, but you can usually get some form of quiche from the cabinet for around $8-9. Should You Call Yourself a ‘Student’?